Electronic advertising signs – also known as digital advertising signs – are a fabulous alternative to traditional advertising methods, such a newspapers, billboards or radio. These are so great because you can display more than one message at a time and you have the option to change the message at any time. Along with this, people either driving or walking past your advertisement are able to read the message from more than 400 metres away! 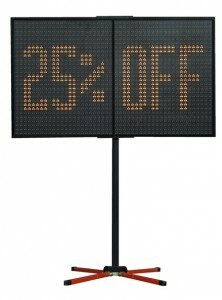 This is due to the high impact, bright and clear communication the electronic advertising signs display. Why choose our Electronic Advertising Signs? Typically, digital advertising signs are used to promote sales, clearances, opening hours and the likes, however, the uses really are endless! One thing is sure though, they generate massive amounts of exposure. Feedback from previous clients has suggested that, in most cases, the use of these has at least doubled the expected sales. This of course, is a huge benefit when it comes to improving business turnover. Our signs can be positioned in shopping centre car parks or medium strips where permitted by councils. When selecting a spot for your sign it is important to consider whether you have the room to position it in a way that it will be readable to all oncoming traffic. At the end of the day, people need to be able to see the sign for it to be effective. For more tips or to hire an electronic advertising sign, get in touch with the team at VMS Hire today!